Sclerotherapy is a procedure used to remove unsightly blood vessels appearing on the skin's surface commonly known as spider veins. Come in for a cosmetic consultation with a member of our dermatology team to see if Sclerotherapy treatment is right for you. Call Chevy Chase Cosmetic Center 240-482-2555 for an appointment in Chevy Chase or 301-345-7375 for Greenbelt today! A concentrated salt solution is injected into the blood vessel using a ultra-fine needlel. Over a period of weeks, the vessel turns into scar tissue that fades, becoming barely noticeable or invisible. You may need to treat a single blood vessel more than once, some weeks apart, depending on its size. In any one session, our provider can inject a number of vessels. Sclerotherapy treatments may have side effects such as minor muscle cramping, red raised areas, red or brown spots, bruising, or a minor allergic reaction to the injected solution. None of these side effects are major, and most disappear on their own or can be treated relatively easily. Injected medications irritate endothelial cells which line your blood vessels. Following treatment, the vein shrivels up and is absorbed by the body. These vessels are not necessary for normal circulation. 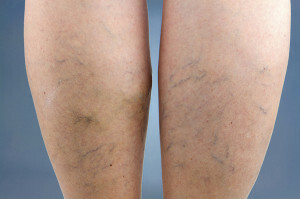 What causes spider veins and how can they be prevented? In most case, spider veins are inherited and cannot be prevented. Multiple pregnancies and female hormones also play a role in the development of spider veins. Reducing your weight may help, although these vessels can occur in slender patients. If possible, avoid long periods of standing. How soon after sclerotherapy treatment will the spider veins disappear? In some patients, the process is quite slow, while in others, it is dramatically quick. Some patients experience fading of small red spider veins. Gradually, with multiple treatments, the veins will become smaller and lighter in color. For others, the spider veins will disappear suddenly after 1 to 2 treatments. Will sclerotherapy treatment permanently erase my spider veins? There is no cure for spider veins, there is only control. New vessels of the same type can occur, often in the same areas, 1 to 2 years after treatment. Touch-ups are the rule to maintaining improvement over time. The physician assistant injects a concentrated salt solution. The solution is mixed with 1% xylocaine, an anesthetizing agent that allows for a more comfortable treatment. This varies with the number of areas injected, as well as the response to each injection. It usually takes approximately 2 to 5 treatments to obliterate about 80% of small spider veins. Less than 1% of all patients will experience any significant complications. Patients who bruise easily, take aspirin, or have certain types of very fragile veins should expect some bruising. Swelling is very common, particularly in patients whose feet/ankles have been treated, in those who have a history of swelling or those who stand for long periods of time. This swelling is never dangerous but when it occurs it is treated with elevation, loosening of dressing, refitting of too tight support hosiery and walking. Patients with a history of migraine headaches will occasionally experience a similar episode (flashing lights, diminution of visual fields) following sclerotherapy. We suggest that patients with a history of migraines or those with a history of fainting eat a solid meal an hour or so before treatment. Can I have treatment during and after pregnacy? If you are pregnant, nursing or planning a pregnancy, we will delay treatment until after pregnancy or you have stopped nursing. Are there are other treatment methods? New lasers may hold promise for treating blood vessels, but currently vessels in the legs do not respond uniformly to laser treatment. Varicose veins are now treated non-invasively with the VNUS Closure procedure covered by most insurance plans. Go to www.MDVeinProfessionals.com for more information. Will my insurance provider reimburse me for sclerotherapy treatments? No. However, if you experience blood vessels that cause pain or swelling of your legs, you may require further evaluation by a vascular specialist.